The purpose of this section is to show you how to edit a Style in Expression Blend. Open your application in Expression Blend. Open your Solution Explorer (View->Solution Explorer or use the Ctrl+Alt+L shortcut). Right mouse button click and select "Open in Expression Blend...". In the "Objects and Timeline" pane (Window->Objects and Timeline) select the Telerik control for which you want to create (modify) a style. Expand the Object -> Edit Style menu. Edit Current - if you choose it, this will open the currently applied style for edit. If you don't have an applied style to the control, this option will be disabled. Edit a Copy... - edit a copy of the default style. When you select this option a new dialog will be opened. 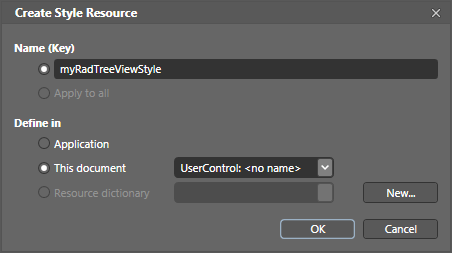 The "Create Style Resource" dialog will prompt you to select a name for your style, as well as to choose the location where your style will be defined in. Create Empty...- create an empty style for the selected control. When you select this option, the same "Create Style Resource" dialog will be opened. You should select a name for the style, as well as to choose the location where your style will be defined in. The purpose of this section is to show you how to edit/create a Template for the Telerik Silverlight controls. In the "Objects and Timeline" pane (Window->Objects and Timeline) select the RadControl for which you want to create (modify) a template. Expand the Object -> Edit Template menu. Edit Current - if you choose it, this will open the currently applied template for edit. If you don't have an applied template to the control, this option will be disabled. Edit a Copy... - edit a copy of the default template. When you select this option a new dialog will be opened. The "Create Style Resource" dialog will prompt you to select a name for your template, as well as to choose the location where your style will be defined in. Note that Edit a Copy... will not declare you a copy of the default template as a resource in your XAML. Instead, it will create a copy of the default style with a ControlTemplate setter. 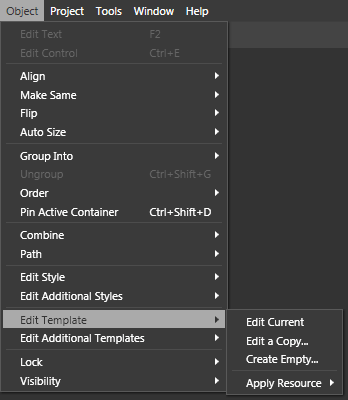 Create Empty... - create an empty template for the selected control. When you select this option, the same "Create Style Resource" dialog will be opened. You should select a name for the template, as well as to choose the location where your template will be defined in. 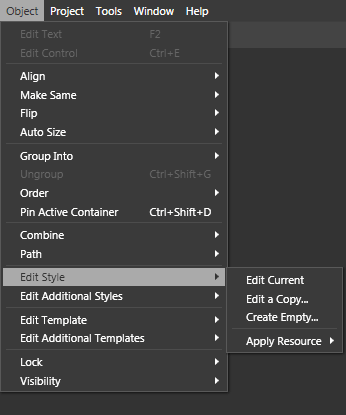 In contrast to the "Edit a Copy..." option, the "Create Empty..." will create a new ControlTemplate as a resource in your XAML. It is not recommended to choose the "Create Empty..." option, unless you are familiar with TemplatedParts for the specific control.